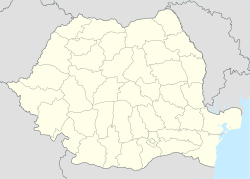 Pericei (Hungarian: Szilágyperecsen) is a commune located in Sălaj County, Romania. It is composed of four villages: Bădăcin (Szilágybadacsony), Pericei, Periceiu Mic (Kisperecsentanya) and Sici (Somlyószécs). The Periciei Council, elected in the 2012 local government elections, is made up of 21 councilors, with the following party composition: 9-Democratic Union of Hungarians in Romania, 3-Democratic Liberal Party, 1-Hungarian Civic Party. The Mayor Boncidai Csaba was re-elected. The Mayor Boncidai Csaba was re-elected. The Mayor Boncidai Csaba was elected. Wikimedia Commons has media related to Pericei. ^ "Pericei, Reformed church". Welcome to Romania. Retrieved 11 February 2018. ^ Alegerile locale in Salaj, rezultate finale! This page was last edited on 19 March 2018, at 06:14 (UTC).